In previous posts, we have been focusing on measurement errors. Good measurement practices are equally important. We often forget about those practices we put in place to make sure our equipment is working properly. Monitoring your process by putting practices in place to ensure that your measurements are accurate is essential to limiting your risk and keeping your bottom line intact. A good stable Morehouse force measurement system can be used to do the following: (1) Force Verification, (2) SPC – Statistical Process Control, (3) ILC – Intra-Laboratory Checks, (4) Proficiency Testing, and (5) A Test Standard to do repeatability and reproducibility tests used to calculate Calibration and Measurement Capability (CMC). 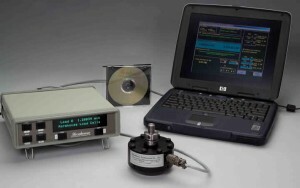 Morehouse ASTM E4 calibration kit. Above: Picture of a 5 in 1 Morehouse 700K system. This system is also used for ASTM E4-15 calibrations. (1) Force Verification – Have you ever questioned if your system is functioning properly? A good force measurement system should be able to take any guesswork out of the equation. The ability to obtain objective evidence based on a quick measurement provides the verification needed to ensure proper operation. A video demonstrating this type of system can be found here. (2) Statistical Process Control (SPC) – This process is similar to verification, with the exception of a documented control process in which an artifact is used to monitor performance of the measurement process. A good load cell system can be used as a check standard to monitor that the process is in control. It can provide the objective evidence and reduce risk. If the process is continually monitored and an out-of-control situation is found, the root cause analysis can be performed to ensure proper corrective action before the machine or process actually goes out of tolerance. 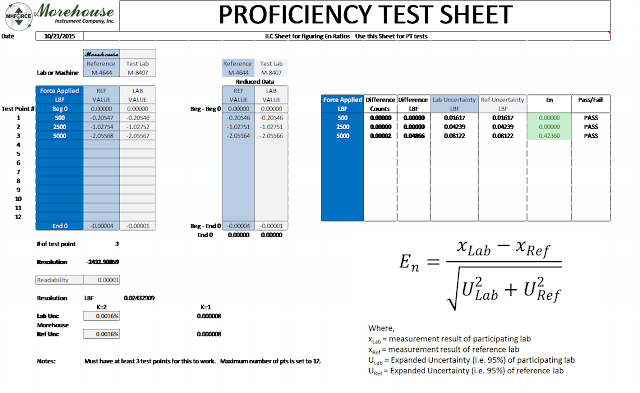 (3) Intra-Laboratory Checks (ILC) – The force system can be used to compare machines, operators or processes. If you are using control charts and the process output is approaching control limits, the system can be used to test what the issue is and to determine which machine, operator or process needs to be corrected. (4) Proficiency testing – This often requires an artifact with a very low uncertainty. If the load cell system is calibrated by dead weight primary standards, the system can be used to satisfy Proficiency Testing requirements. This should be done immediately after the system is received. (5) Repeatability & Reproducibility – A device with very high resolution and low overall uncertainty will allow the end user to lower their Calibration and Measurement Capability (CMC). 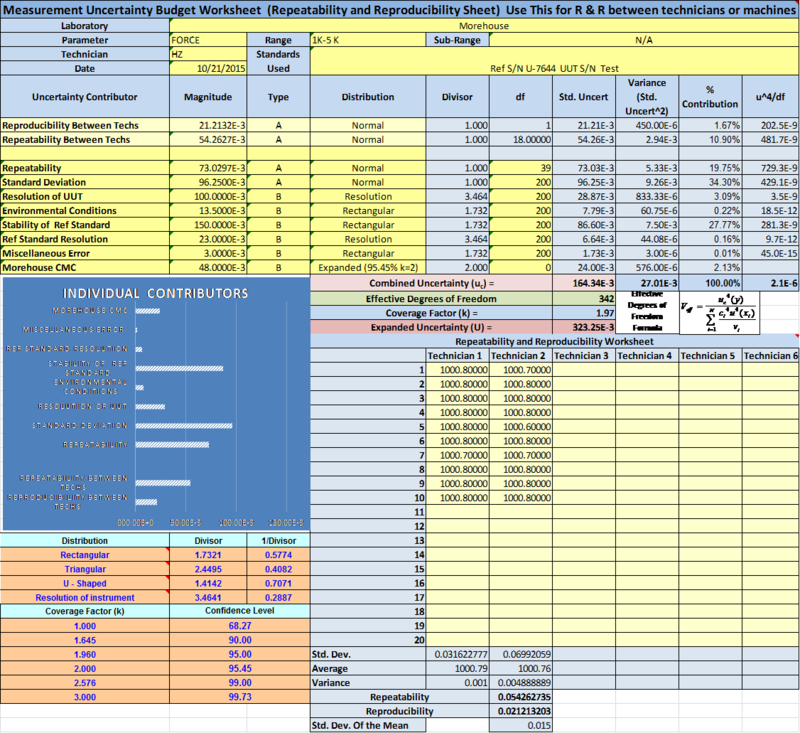 When calculating CMC, the resolution of the system being used must be figured into the calculations. The lab will need to perform repeatability studies. An artifact with low sensitivity to side loading, temperature compensation and stability will be a lab’s best asset (see note below). A good system will often decrease the variation in output between multiple measurements. It will also allow the lab to test the true performance between technicians. 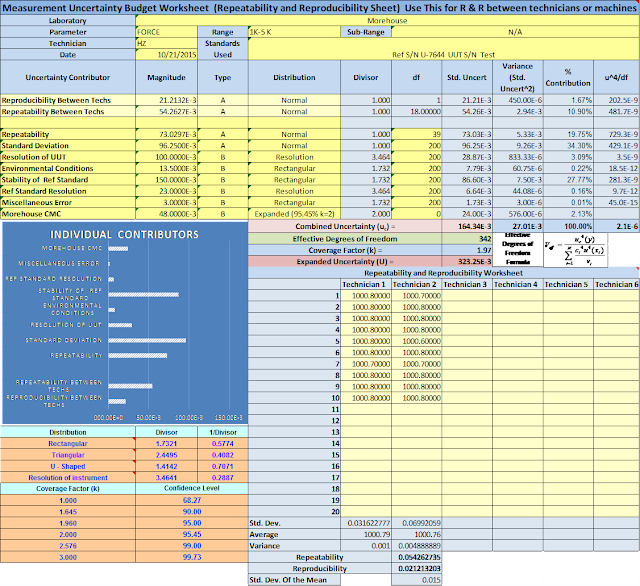 R & R data may be derived from control charts if they are set up properly. When a buyer evaluates a system based on requirements such as cost, accuracy, and ease of use, they often forget to look at what really matters. They might even get caught by marketing claims and forget to read the fine print. A good force measurement system will allow you to keep your measurement process in control. The right system can truly kill five birds with one stone and is in line with the K.I.S.S principle (Keep It Simple Smart). Note: If the load cell is not temperature compensated, the expected performance may decrease by about 0.015 % per degree Celsius, resulting in a decrease in accuracy. However, side-load sensitivity may have the most significant impact on the expected performance of the system. Morehouse has conducted several tests and has demonstrated that side-load sensitivity can vary from 0.002 % on a Morehouse shear web type load cell system to up to 0.75 % of full scale on other types of load cells. If you are buying a load cell with a 0.5 % accuracy specification, do you think it is really accurate when the slightest bit of off-center loading produces a 0.75 % error?